Featuring one terabyte of space ( 1 TB = 1 x 1012 (1, 000, 000, 000, 000) whereas one gigabyte (1 GB = 109 ( 1, 000, 000, 000). 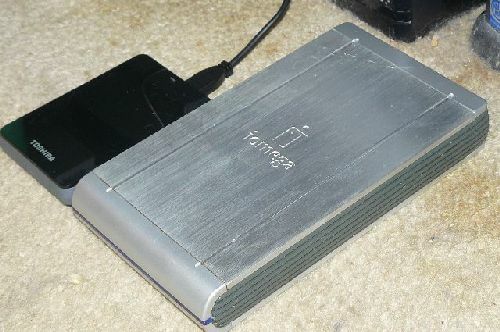 USB 3.0, and, disk imaging software are also included to back up your existing computer hard drive, this portable drive is no bigger than the average QWERTY keyboard mobile phone. From the time I took it out of the packaging and plugged it into my Windows desktop, it worked perfectly. If you’re concerned about rigging new hardware, rest assured, the Toshiba is about as idiot-proof as you can get which makes it custom ordered for the technology challenged. I did some research on the drive beforehand, and, was intitally concerned that USB 3.0, despite being touted as backwards compatible with USB 2.0, wouldn’t work on my XP box. But I was pleasantly surprised when it ran just the way it was intended with my existing USB 2.0 ports. Where Macs are concerned, the Toshiba is formatted with NTFS and can be read and written to on a Windows PC. Mac OS X can read data from the drive with no additional software, but if you want to write to the drive, then you have to install the software which is already loaded on the external drive. Once installed, Tuxera NTFS for Mac will enable both read and write support for the NTFS partition on your Mac. If you’re looking for a highly portable, easy to use, mass storage device to replace a thumb drive (as I was) then this drive is for you. The price tag is not cost prohibitive and retails for approximately $70.00. Disclaimer: I am not receiving any kickbacks from Toshiba or any other company for this review, but tips are welcomed and appreciated using the Pay Pal link located on the uppper right hand side of this page. Note: The Canvio has an L.E.D. located at the top of the case that will blink white intermittently when reading/writing to the drive, but goes black when the drive is idle.